SINGAPORE - About 900,000 Singaporean households living in Housing Board flats will receive vouchers to offset part of their utility bills this month. 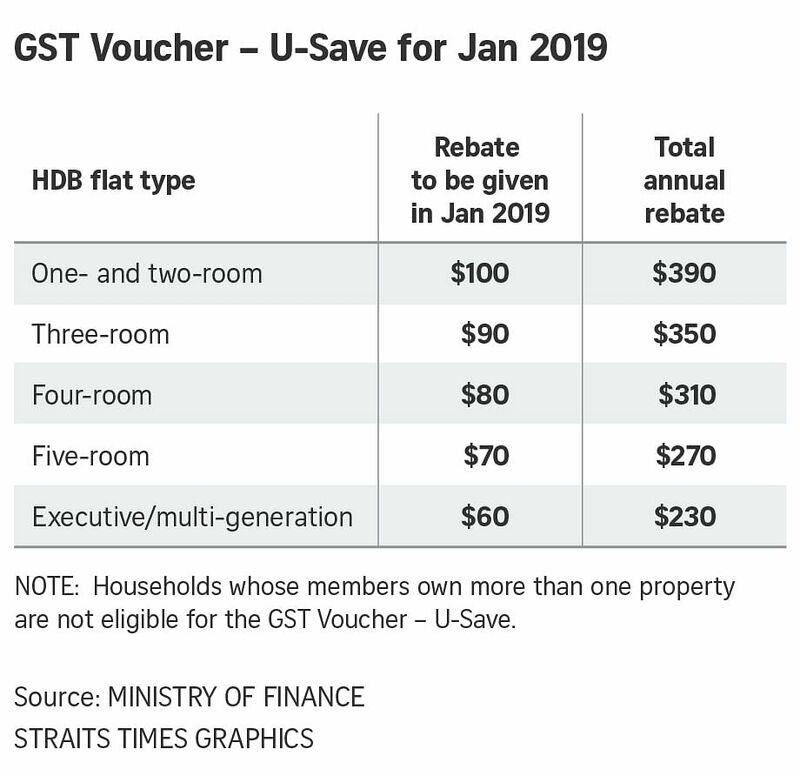 The Ministry of Finance said in a statement on Wednesday (Jan 2) that these households will receive a Utilities-Save (U-Save) rebate of up to $100 this quarter, or up to $390 annually, depending on the type of their HDB flat. U-Save is one of the three components under the permanent goods and services tax (GST) voucher scheme, which aims to help lower overall household expenses. It is distributed every three months. It was previously announced in Budget 2018 that eligible households will receive an additional $20 a year (or $5 per quarter) for three years, starting this year. For the current quarter, households in one- and two-room flats will receive $100 and those in three-room flats will get $90, while families living in four-room flats will have $80, the ministry said. The ministry said in its statement that the scheme has enabled households in one- and two-room HDB flats to receive support equivalent to about three to four months of their utility bills on average in a year. Those living in three- and four-room flats will be given support equivalent to one to two months of utility bills, it added.